The 2019 County Youth Championships will be held on Sunday the 29th of September. Be sure to keep the date free. Note that while a date in March had been previously suggested this has not proved to be feasible, unfortunately. Congratulations to the winners and all who took part in the championships on the 23rd of September. The full results are now available to download. Huge thanks as ever to Neil and Paul for organising and running the event on the day and to all the volunteers. We are fortunate to have St. Francis School in Pewsey as a venue again and moreso as a result of the postponement from the original date in March. Following the unfortunately necessary postponement of the Youth Championships in March due to the blizzard, the competition has now been rescheduled for the 23rd of September at the same venue. Competitors who entered for the original date just need to contact Neil Bromley to confirm their attendance on the new date. Anyone else wishing to compete should fill in and return the entry form. Full details are on the Events page. As a result of the sudden heavy snowfall in mid Wiltshire overnight the Youth Championships scheduled to take place today has had to be postponed. Please do not attempt to travel to the venue. The competition will be re-scheduled for a future date. Congratulations to everyone who took part in the County Youth Championships in March. The full results are now available to download. Thanks to Neil Bromley and Paul Mowbray for efficient running of the event on the day and to all the volunteers who helped to make the day a great success. We are very grateful to St. Francis School in Pewsey for accommodating us this year. Southern Region are inviting entry applications for the 2016 Cadet Winton. Entrants must be over 14 and under 18 on the 1st of January 2017 and be available to fence on the weekend of the 17th of December. Fencing is a cruel mistress when she wants to play! Wiltshire performance in this years Excalibur ended with us in 9th place. However the difference between 9th and 5th is by a margin of 4 victories. I can't fully report on épée and sabre, but the men's foil had 12 fights going to 4-4 but only able to convert 3 of them. So by saying that had Lady Luck been smiling on us this year we would have easily been higher up the table. Everyone else 1 win out of 8. So looking at this we may be ranked 9th, but in each weapon Wiltshire is definitely not last. There are too many individual points and praises I want to raise but the biggest thank you is to all squad members that gave up their weekend to fence for the county. Thanks to Alan Knowles & Robert Brungies for coaching, supporting and even kitting up to fence, when we were a man down in the last match. Massive thanks to parents and spouses that taxied and supported the team. Big adoration and appreciation to all spouses and partners of the team that allowed us merry band of wanderers to vacate our weekend with them to fence for the county, without them Wiltshire wouldn't be there. Take heart everyone we will return next year and convert those 4-4s to our favour. The results are now available from the county youth championships. Despite the frustratingly bad timing of Wiltshire Council in closing the street a full day of fencing produced some great performances and the competitors and organisers are all to be congratulated. The Junior County Championships scheduled for this coming Sunday in Salisbury will go ahead as planned despite last-minute notice from the council that Exeter Street is to be closed to all traffic between 09:30 and 15:30 that day. Competitors, supporters and volunteers expecting to arrive at the venue before 09:30 and leave after 15:30 may use the school car park. Otherwise the usual city centre car parks should be available - the Culver Street multi-storey has free parking on Sundays. We can only apologise on behalf of Wiltshire County Council for the undoubted disruption that this will cause. As in previous years, Wiltshire are assembling a 6 weapon team to compete in the prestigeous Excalibur tournament. The competition will be held at Bath University (hosted by Bath Swords club) on the 23rd and 24th of April 2016. Enquiries are now invited from interested members of clubs in the county. If you would like to compete, or want to know more about what is involved, please contact the County captain, Andy Courtney on ajcourtney@gmail.com. This year the County Championships returned to Prior Park School in Cricklade. The event was held on the 22nd of November and all four clubs in the county were represented. We would like to thank the school for the use of their sports hall and also to Neil Bromley of Swindon FC for organising the event once more. Congratulations to all the winners at the county youth championships yesterday and a very big thank-you to all the other competitors, referees and organisers for a successful day's fencing. The Wiltshire County Championships were held at Prior Park school on the 23rd of November. The event was well attended with all four clubs in the county being represented. Special thanks are due to Neil Bromley for going to great lengths to organise this event in particularly trying circumstances. The youth championships were held at Sarum Academy Sports Centre on the 23rd of March 2014. The results showing the winners in each age group are now available to download. Well done to all the participants and a big thank-you to the organisers for this well-run event. Please note that the committee meeting scheduled for this coming Sunday (30th June) has been cancelled. The next meeting is expected to take place in September. The County Junior Championships have had to be rescheduled to the new date of the 17th of March. The new deadline for entries is the 3rd of March. Epee and Sabre competitions for U16 and U20 will go ahead too. See the events page for more info. The Jnrs sadly didn't get to fully represent the county as both BBO & Hampshire didn't bring any Junior foilists. They fought a mini competition in which after a poule for ranking and the Direct elimination the results were as followed: 1st Lewis 2nd Ollie 3rd Equal Charlie & Jack 5th Zeyna. A huge thanks to Zeyna who replaced an injured Eve at the 11th hour. ( We will try and make sure that next year that Hampshire and BBO are bringing a Junior foil teams as it was pretty disappointing for them). The Seniors foil team won the foil. I am not 100% sure of the score with BBO as they failed to produce any female foilists, I was informed by Austen that Wiltshire claims victory. 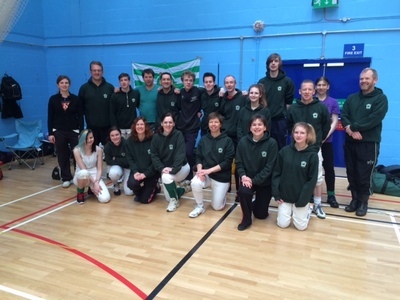 The match against Hampshire was match that decided Southern region foil team champions. Wilts Team won 14-11. Some excellent fencing from Mark & Austen and from our non-Swindon female Emily. The prefect revenge for our defeat at Excalibur this year. To be held at Sarum Academy Sports Centre, Westwood Road, Salisbury, SP2 9HS on 5 Feb 12. Contact: Geoffery Russell for further details on 01980 862355. Entry forms under "documents" titled County Youth Champs. Mark entry form with weapons that you wish to fence. I've been managing the County Fencing Union for the past 3 years or so and found the role very rewarding. Unfortunately, I'm having to leave the County, so must hand-over my role to Clive Ambrose-Williams. He is taking over as Treasurer. I've enjoyed being a Coach and Manager in and for Wiltshire fencing and wish the County well. I'm glad that a formal Committee is being formed: it's desperately needed to ensure that a County vision can be realised. My very best wishes to them - and Good Luck! And if anyone wants to be part of the Committee, I'm sure they'll be looking for volunteers to get the County fencing profile raised, and to have the various Clubs working together. Entry forms for Southern Region Senior Epee and Sabre, 21 May 11, are posted in Documents. Mens Foil: Neil Bromley, Mark Vice, Chris Reynolds, Alix Dawson and Andrew Cushing. Ladies Foil: Michelle Townley, Claire Cuthbert, Kayleigh Williams, Emma Eklof. Mens Sabre: Sam Gibbs, Clive Ambrose- Williams, Martin Chadwick. Ladies Sabre: Rosie Burgess, Harriet Davies, Chloe Walsh, Laura Rogers, Kevanne Sanger. Mens Epee: Steve Tatner, Alex McGeogh, Ian Smith, Stuart Smart, Laurence Moody, Alan Knowles. Ladies Epee: Clare King, Zoe Sheehan, Vanessa Wilen, Deidre Godfray, Joanne Wheeler. All fought very well, maintaining a consistent level of performance throughout the weekend; unlike other Counties, who were starting to show signs of fatigue by Sunday afternoon. This was Wiltshire's first run-out in a major team event and, although the County didn't win, the other Counties had to work hard to get their points off us. Very well done to all. The bench-mark has now been set and Alan will be organising training events for the County teams in preparation for the next one. We did OK this year after only about 2 months of dedicated training for the event. Imagine where we could be with a year's training behind us..! As you know, Wiltshire is putting a team of fencers into this year's Excalibur event, 7-8 May at Bath University. This is the culmination of a huge effort by me and Alan Knowles in getting the County recognised as a player in the Regional (at least inter-County) fencing scene. The fencers competing will need support, especially cheering-on. Please make every effort to attend at least parts of the days in order to show them your support, and to show the other Counties that fencing is alive and active in Wiltshire. The event also needs Referees for all weapons. So if you can come along and Referee some bouts during the days, that would be a big help to us and the organisers, again showing that Wiltshire is active in all fencing activities. Further to a call for nominations for new County Committee members on 2 Nov 10 there has only been one nomination: Clive Ambrose -Williams, Swindon Fencing Club. So hand-over of this role has commenced: Clive should now be the point of contact regarding Treasury matters for Wiltshire Fencing Union. The Secretary's post has received only one nomination, too: Robert Jandy. So I recommend that Robert becomes Secretary for Wiltshire Fencing Union. Hand over will commence later this month, with a view to be complete by Excalibur 2011. The Committee requires support from all fencers and Clubs in the County. It will only function, delivering a unified Vision for the County, if all are bought in to the organisation and its values. Please give Clive and Robert your support as they deliver what is best for the County. And should there be other fencers in your Clubs who wish to get involved in County-level organisation and delivery of our sport, I've no doubt that they will be made welcome. I still believe that there should be a Chairman, for overall Leadership. Mike Bradbury remains Team Captain for the County. Alan Knowles is leading on the delivery of our County Performance Development programme. Should anyone have any comments or queries regarding these appointments, please contact me in the first instance, before Excalibur 2011 (i.e. by 6 May 2011). Excalibur Training will take place at at the Pewsey Sport Centre, Wilcot Road, Pewsey, Wiltshire. SN9 5EW, 10 and 17 April 2011, 10 am - 3 pm. Please make every effort to attend - Excalibur can be a very demanding event, so lots of preparartion is required. The results from the Senior Championships, Oct 10, have been placed in the Documents area. A benchmark for the ones in Oct 11! URGENT - Venue Change 13 Mar 11! The venue for the training day on Sunday, 13 Mar 11 (i.e. this coming Sunday) has changed, to Lambourn Leisure Centre, Close End, Lambourn, RG17 8NJ. I know its not Wiltshire but its the best that we can do at short notice! County Training on 13 Mar 11 at Marlborough Sports Centre will focus on the development of the fencing teams for Excalibur 2011, although even non-team members will benefit! Speak to Alan Knowles, Swindon Fencing Club, for further info. You'll all be plesed to now that Alan Knowles and Austen Rose, of Swindon Fencing Club, are now members of the Southern Region Competition Committee. This is a significant role as they will be involved in the organising and running of Region events. Please give them your support where possible. Southern Region have a number of events coming up over the next few weeks. Be sure to check their web site - and your Coaches and Club Leaders, who also have information. We've been invited to compete in Excaliber, this year. This is a prestigious team event so we'll be looking for 3 Man teams, for Men and Ladies Epee, Sabre and Foil. Speak to your Coaches and Club Leaders for further details. Regrettably, we've had to cancel the training event scheduled for 9 Jan 11 because of a problem with the venue. The next event will be 6 Mar 11 at a venue to be determined; it will also be focussed on the teams for the Triangular in April. New site for Wiltshire Fencing! Today sees the launch of the new web site for the WFU which we hope will be very useful for keeping local fencers in touch with what is happening at county level. We welcome your comments on this site and hope you find it a useful resource.